I’ve wanted a vintage buffet for my dining room for two years, but I’m like Goldilocks. Every buffet I found was either too big or too small, too modern or too plain. It took me two years to find one that was just right! “I think this is it, but I’m not sure,” I said to Dave when we found this one. We knew the buffet needed a lot of work. For starters, it had previously been painted white, but the paint job was very sloppy. It needed some structural repairs too, including rebuilding one of the drawers and reinforcing the back, which had sustained some damage over the years. 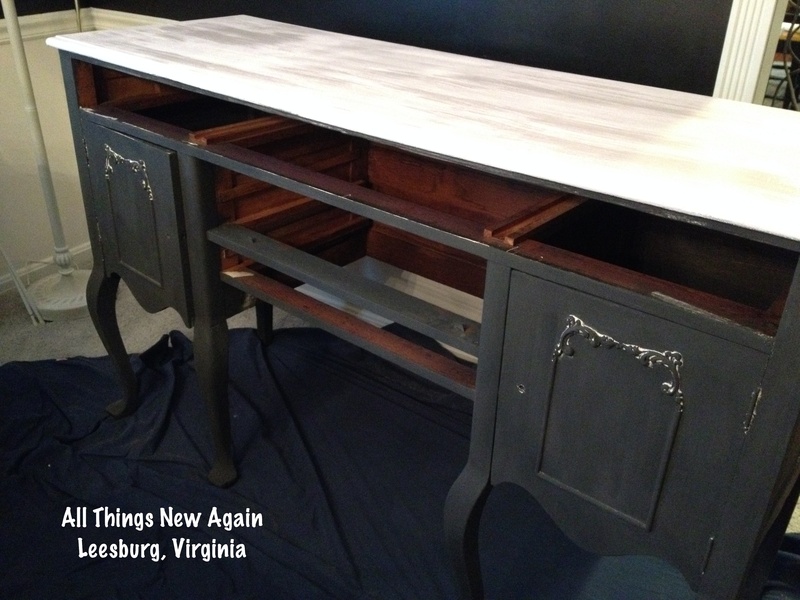 We looked past its flaws and brought the buffet home knowing we could make it beautiful again. The buffet fit the space in our dining room perfectly! I love its pretty legs and the scrollwork—and it has plenty of storage for my table linens and holiday dishes. 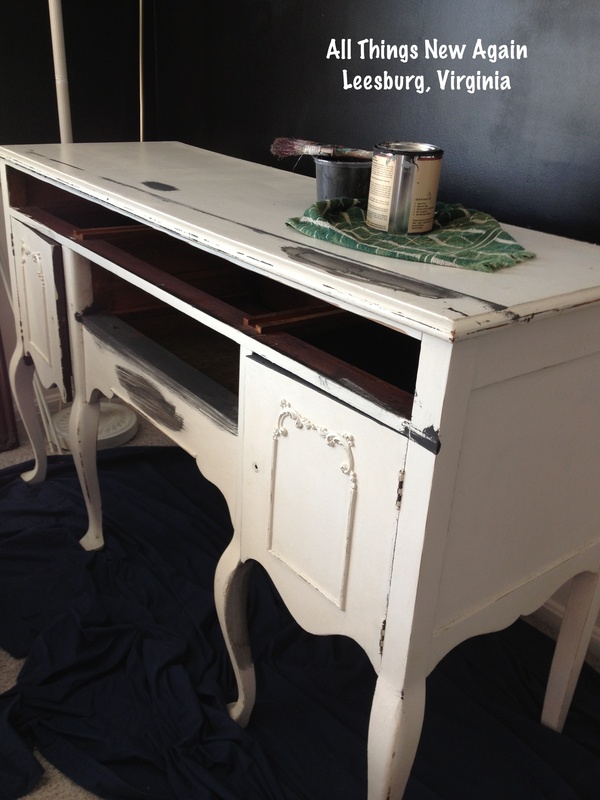 It just needed a little TLC along with a new and improved paint makeover! Dave went to work on the repairs. I painted the bottom of the buffet, including inside the cabinets, black. Then I painted the top a light–almost white–soft shade of pink. The buffet looked much better at this point, but I wasn’t done yet! 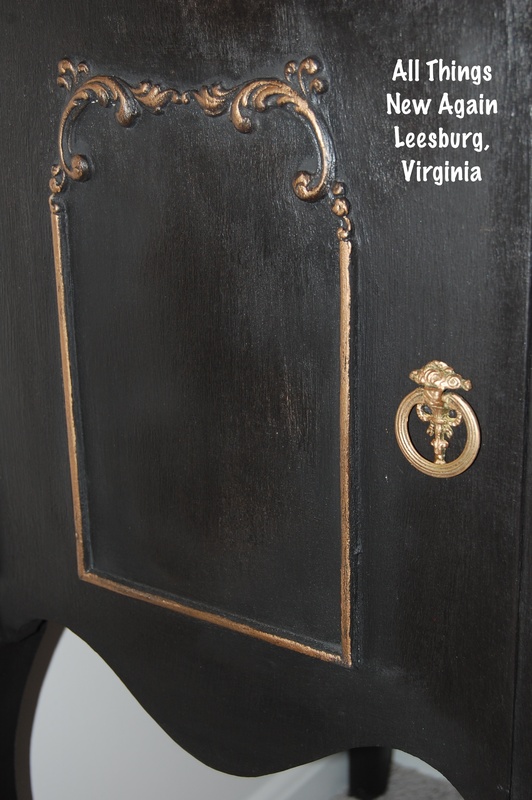 I knew the buffet would look spectacular with some Rub ‘n Buff gold metallic finish, which I applied to the scrollwork on the doors and the handles to make them pop. I also applied more gold Rub ‘n Buff along the scrollwork for pizazz. Here’s the finished piece. It’s even better than “just right”—it is exactly what I was looking for. This buffet was well worth the two-year wait. I absolutely love it! 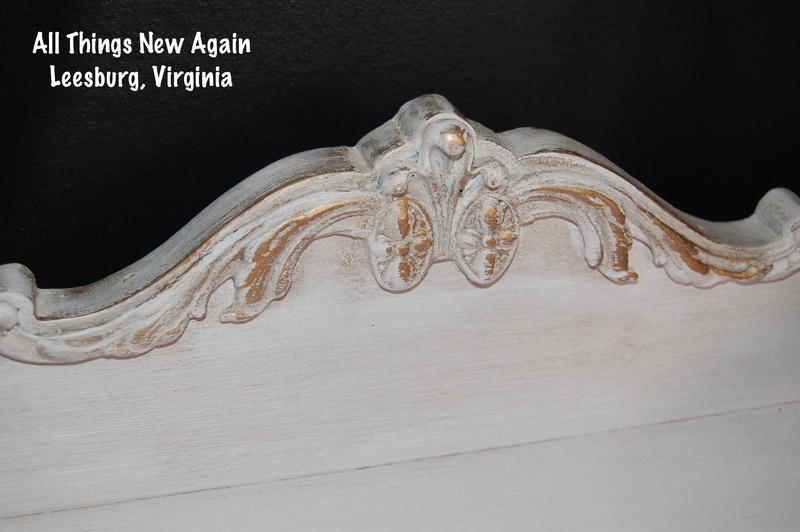 All Things New Again is a family-owned furniture and paint boutique in Leesburg, Virginia (about an hour or so west of Washington, D.C.). We offer eclectic hand-painted furniture, several lines of paint for your next DIY project and painting classes and workshops. Stop by the next time you are in town! 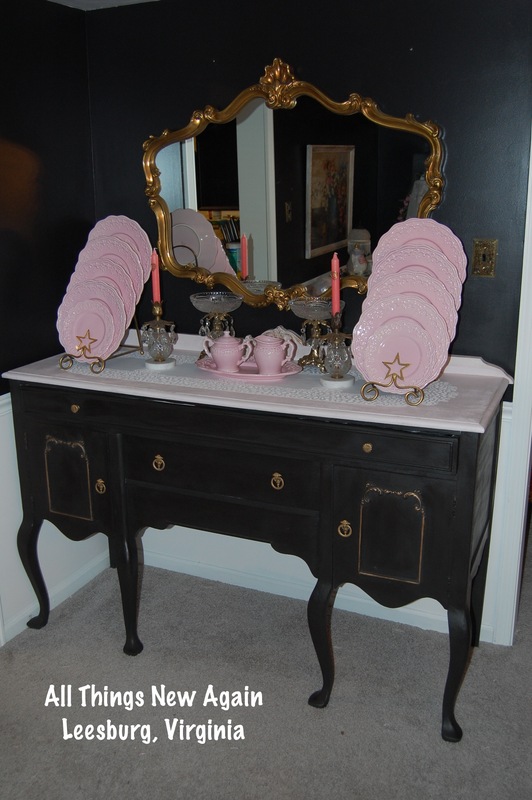 Cathy, the buffet is a great addition to your “pink room”. What a fantastic outcome! Thank you Ida! Merry Christmas!